Years ago my Grandma used to say she made a path on Galmpton Common. When the lower path (running parallel with the main road) was muddy or waterlogged, another gradually appeared. Other people probably had the same idea but Grandma always referred to it as 'my path'. She has long since passed away and over the years I have often walked along her path; witnessing it grow wider and more well-established. Aside from golf practice (aiming to hit the ball straight between rusty goalposts), riding my bike and the odd kick-around, I realise now that I have mainly passed through the Common in order to get somewhere else and have largely been immune to its charms. So it seems fitting that I try to make up for lost time by truly immersing myself in this patch of land. It was Grandma who first got me interested in wildlife. She used to take plant cuttings from walls and rejoice (as all keen gardeners do) when they returned the favour by growing and prospering. She loved to see the birds in her garden. A pair of collared doves were her favourites and they returned time and again to feed from her bird table. Grandma also had a copy of the AA Book of the British Countryside. It was like an A to Z of wild flowers and creatures, with tools and crafts and rural skills in between. I often used to read the description of an adze simply because it was near the beginning and I was struck by the word. I looked at the hundreds of diagrams; wondering (as I sometimes still do) if I would ever learn the bewildering number of different bugs and plants by heart. And even though a lot of the common names have changed since 1973 (when the book was first published) I still refer to it now, and often manage to gain some fresh insight when more advanced technical guides have left me thoroughly perplexed. 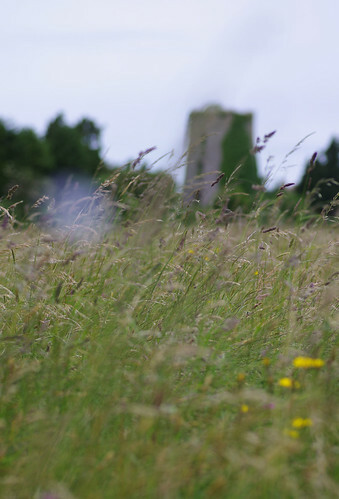 Its canvas cover shows a green field, thick with grasses and ox-eye daisies (some in focus, some dreamily blurry.) It could almost be Galmpton Common. Among the plethora of grasses we found St John's-worts in bud, the shaggy, over-sized seed clocks of Goat's-beard, two dropworts, common figworts by the roadside verge and these impressive seeds of the Curled Dock. The unseen curling leaves at the base give this plant its name. 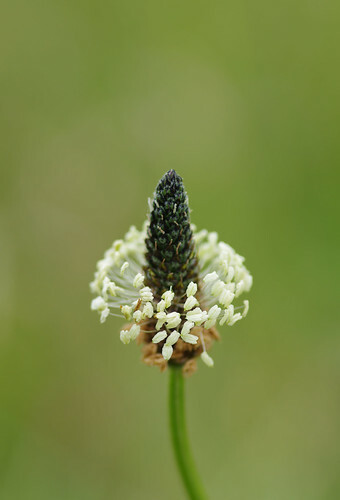 The patch of blurry white in the top left of the picture above is called cuckoo spit and is made by the nymphs of froghoppers. 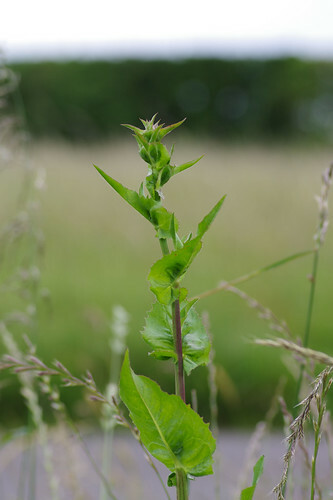 Also on the verge, close by the Common Figworts was this Prickly Sow-thistle. Sherry took several shots but I like this profile shot best of all. The leaves can be variable. 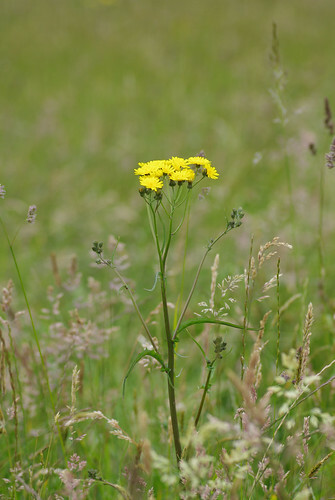 At the top, a yellow flower will eventually emerge. 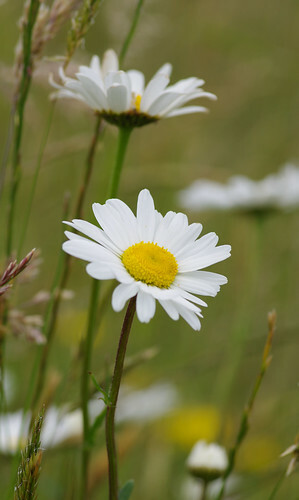 These plants also grow as weeds on waste ground and in gardens. But viewed in this flattering light they might force the most constant gardener to think twice before tugging at the roots. We crossed over, trying not to trample on anything. A few weeks ago the common was temporarily occupied by travellers. Flowers are already colonising the patch of bare ground. I took a closer look and spotted something I had not noticed before. Goat's-beard flowers were developing from the bare earth but one in particular caught my eye. It was discoloured and disfigured. 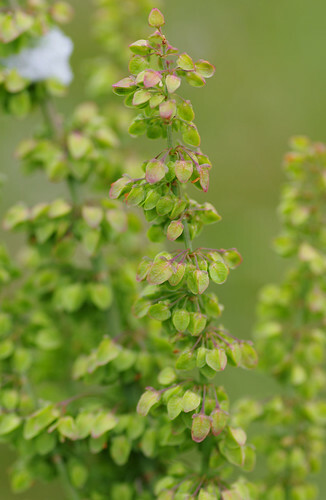 Research at home later revealed the fungal plant gall Albugo tragopogonis was the culprit. There were several of these vetchlings on the grassy verge. 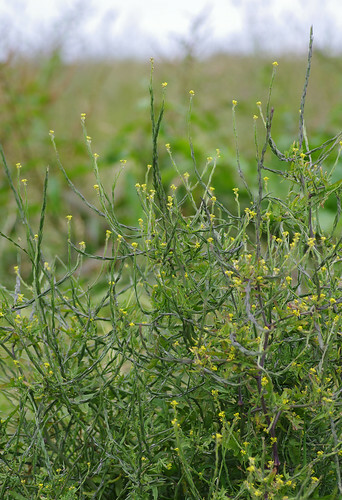 The yellow flowers sit on a long single stalk connected to the main stem. 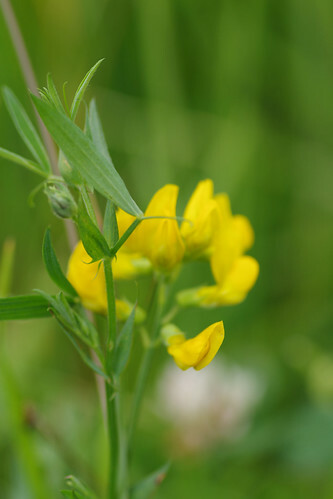 The flowers are similar in shape and colour to the bird's foot trefoil species but the narrower leaves are more like vetches, whilst their arrangement is similar to the pea family. 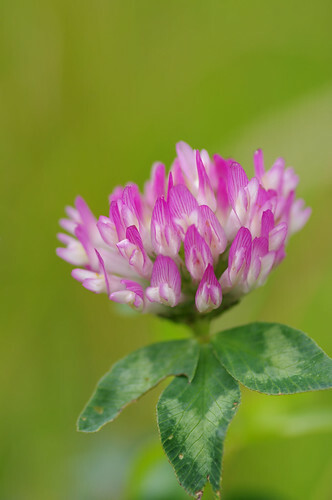 Clovers are one of the archetypal meadow flowers. The leaves of red clovers can be more rounded than other species in the same family and have the distinctive v-shaped mark. They were numerous on the common but I did not trouble to count the leaves in the hope of finding a four-leaved clover. Instead, I looked at the composite flowers close-up, seeing new shapes and patterns in the petals. When I was at school these plantains used to be picked and used in a game similar to conkers. The winner would be the one who had successfully whipped their opponent's head off. These days I leave them intact. The shape of the seeds is similar to many of the grasses we saw on the common. 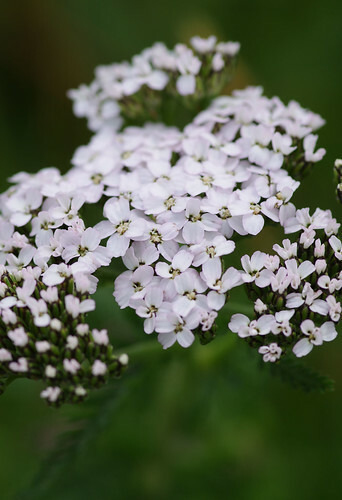 With its feathery leaves and multiple-flowered pattern, yarrow is fairly easy to identify. The flowers can also be slightly or deeply infused with pink. 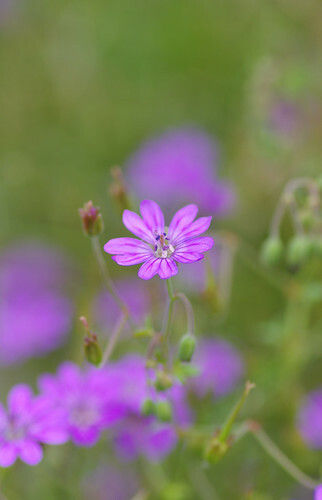 In our amble around the meadow, there were other flowers that did not really come out: a solitary poppy, several dove's-foot crane's-bills that would not stay still in the summer breeze and scattered flax flowers that Sherry did not give up on quite so easily. She was most successful with this specimen. 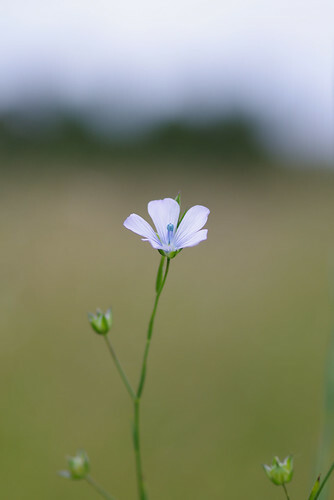 Pale Flax has less leaves along the stem and, as the name suggests, has a paler blue flower than its common counterpart. There was the equivalent of a lovely pink carpet of these crane's-bills. And where there are flowers, you are sure to find the odd pollinator. At first glance, the eyes are fooled by the brown fur into thinking this might be a bumble-bee. 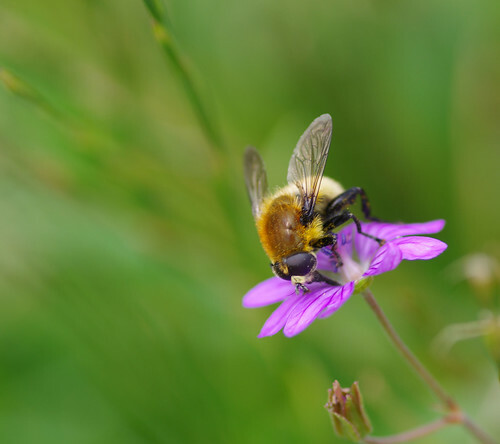 But the fur above belongs to a member of the hover fly family, of which there are over 250 British species. I'm not quite sure how but Sherry has worked her photographic magic here. The green background is blurry but the faint diagonal lines also give a sense of movement. Or perhaps it was just luck? The resemblance to the AA Book of the British Countryside book is positively uncanny but it was just a coincidence. Predictably, I was bound to get stuck sooner or later. This could be the rough or the smooth variety of hawk's beard. I will return later in the year and attempt to find the answer by analysing the shape of the seeds. This tangly upright bordered a dirt gravel track. We had almost had our fill of flowers and decided to give the Lady the run she richly deserved. She bounded through the long grasses, skulked through the undergrowth like a long-dog and became an indistinct black form, like an escaped beast from a zoo. After the collie had worn herself out, we merry three walked back by the inner path. I examined the hedge every so often. I had been hoping for a day-flying moth or two to make our day complete. Usually micro-moths give me the biggest headache of all. This one was tiny and brown and I thought I would have to end my search before it really got going. 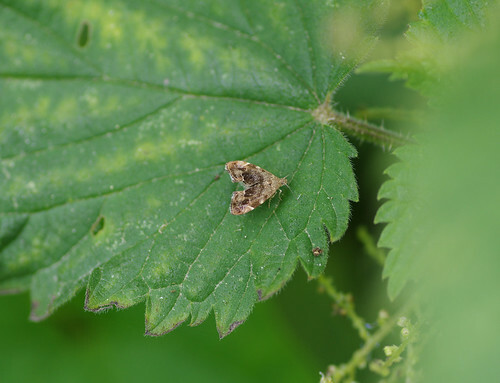 But the shape (with a deep notch in the wings) helped and the fact that it was on a stinging nettle leaf sealed the matter once and for all. It felt like a small victory but a victory nonetheless and a perfect way to close the loop of our leisurely amble around the common.